In the morning, Tourism Himalayas representative will pick up you from hotel and transfer to the railway station to board super fast train (Shatabdi Express) to Haridwar. 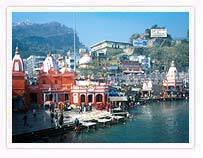 Haridwar is one of the most famous pilgrimage centers for Hindus. It has very rich ancient religious and cultural heritage. It is also known for rich natural wealth. Located on the banks of sacred river Ganges, it is one of the most holy cities of India where a large number of devotees. It is famous for temples, nature beauty, Ganges ghats, ashrams, etc. On arrival at Haridwar, you will be transferred to your pre-booked hotel. In the afternoon, proceed for sightseeing of this holy town. Major attractions in Haridwar include Har-Ki-Pauri ghat, Sapt Rishi Ashram, Sapt Sarovar, Mansa Devi Temple, Chandi Devi Temple, Maya Devi Temple, Daksha Mahadev Temple, Pareshwar Mahadev Temple, etc. In evening do not forget to attend at Aarati ceremony held at famous Har-Ki-Pauri ghat – one of the most sacred ghats in India. Have a relaxed breakfast at the hotel. Later drive to Rishikesh, also known as the “place of sages” or the “yoga capital of India”. Rishikesh is not only popular among pilgrims but also among nature lovers and adventure seekers. On arrival at Rishikesh, check-in at hotel. Later proceed for sightseeing of Rishikesh exploring picturesque places, yoga & ayurveda ashrams and temples. Major attractions in this city include Laxman Jhula, Bharat Mandir, Kailash Niketan Temple, Satya Narayan Temple, Neelkanth Mahadev Temple, etc. Spend rest of the day in your own holiday activities. Have a relaxed breakfast at the hotel. Drive to Haridwar where you will be transferred to railway station to board the train back to Delhi.